Well, we've made it! Summer is here so I guess that means that picnic and barbeque season has officially begun!! (I guess technically summer doesn't officially start this year until June 21, but to me summer is right after Memorial Day). I got some great tips on how to keep your food in your cool nice and chilly from on of my favorite blogs-Jillee from One Good Thing from Jillee-and I thought I would share them with you. 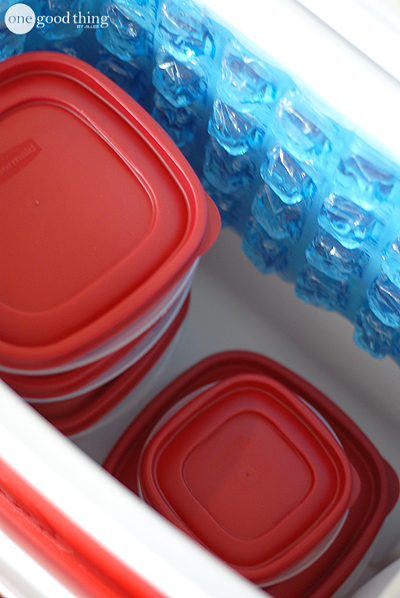 -Hard plastic coolers with thick walls will keep food colder longer than lighter weight coolers or insulated bags. Think of your classic, trusty red Foreman. 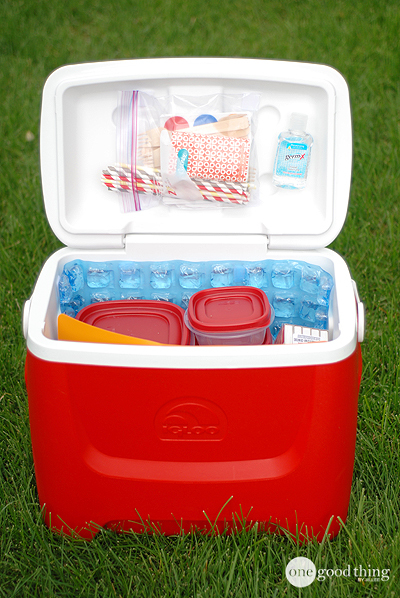 -Start by pre-chilling your food, drinks and your cooler! Obviously food and drinks can just go in the fridge but filling your cooler with ice a couple of hours before you add the food will ensure that your food stays colder, longer. -Forgo messy loose ice for reusable ice sheets. I've always used standard blue ice packs but found these at Walmart and I like them so much better! These are nice and thin so you can fit them around the sides of the cooler or even squeeze them between food. -Pack sandwiches, yogurt, cut-up fruit, veggies, etc. in stackable plastic containers. They are a great way to stay organized! The small ones are especially great for salad dressing, dip, peanut butter etc. If you are packing any raw meat make sure your containers are water tight so juices don't drip onto other food. Pack these on the bottom of the cooler for extra insurance. -Fill left over space with small water bottles. I know using tiny bottles of water isn't the most eco friendly thing but they make packing easier and you're less likely to end up with half-drunk water bottles strewn all over your car. You may also want to freeze your water bottles to add an extra layer of chill. You could also consider packing a separate drink cooler so you aren't constantly opening the cooler with all the food and letting the cold air out. -Don't forget a couple of thin, flexible cutting boards and some knives for cutting up fruit and other food for tiny hands. 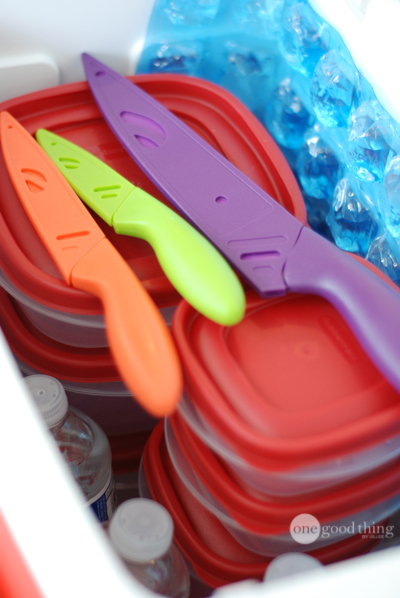 These knives are especially cool since they have covers for the blades, which ensures you won't accidentally cut your hand when reaching into the cooler. 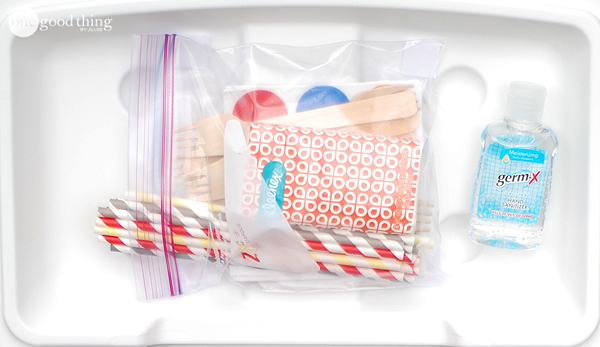 -Pack things like utensils, straws, napkins, tissues etc. in a plastic baggie. Attach it to the top of your cooler with Velcro strips. Don't forget hand sanitizer since you might not always have easy access to running water. Attach it to the top of your cooler with more Velcro strips for easy access. -You might also want to throw in some extras like wet wipes, matches and a small first aid kit. -Keep the cooler in the car rather than in the hot trunk. And there you have it! I hope you find some of these tips useful for your summer adventures in the sun!